In a touching, educational, and surprisingly thought-provoking memoir, John Schwartz tells the story of his son, Joseph—and, ultimately, of other LGBT youths. 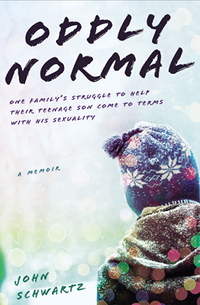 The focus is on Joseph’s unique journey, but the author also uses this tale to reflect on challenges faced by LGBT youths plus teens in general. Topics include sexuality and the social atmosphere, the ramifications of coming out, and statistics on gay teens (and the strengths and weaknesses of that evidence). Joseph’s struggles also highlight mental health concerns, ranging from teachers tossing diagnoses at children to the use of powerful medications on growing bodies. The story begins with Joseph’s suicide attempt and then backtracks to his birth. The author describes a slow progression of thoughts about his son’s life, with contemplation of early signs of his sexuality and his journey through the stages of childhood. Between chapters exploring his son’s life, Schwartz provides information on both sexuality and mental health. While he offers a wide range of statistics, he also evaluates the quality of the data and studies that have confirmed or refuted what often are considered well-known facts. As Joseph’s unique personality emerges, troubling behaviors begin to appear as well. While they aren’t evident at home, the behaviors are observed at school, and include confronting authority, biting the back of his hand, and difficulties socializing. These behaviors—which vary and fluctuate year to year depending on how the teacher reacts to Joseph—lead to conflicts with the school system, visits with a series of therapists and counselors, and a flood of diagnoses. While sexuality does play a key role in Joseph’s story, it’s the mental and behavioral health issues that become the focus, although the two are related. The Schwartzes hesitate to place young Joseph on medication, especially when different therapists and psychiatrists can’t agree on a diagnosis, and so, for a large portion of the tale, Joseph faces his problems with the help of mental health professionals both in and out of school. The book analyzes the debate about whether children should be given psychotropic medications for their mental and behavioral health conditions but, for the most part, this doesn’t affect Joseph until the pressure at school from his declared sexuality culminates in a suicide attempt at age 13. This thrusts him into a more intense evaluation of his behaviors and identifies one major motivating factor as depression. Once Joseph begins taking medication for his depression (the author includes a discussion about what medications may be most appropriate for children) and resumes therapy, he improves. His new “out” status also enables him to join the LGBT community and see that he’s not as alone and isolated as he previous felt. The memoir ends with Joseph still in high school but in a hopeful, happy place. Oddly Normal is a memoir, not a self-help book, but Schwartz acknowledges that the story he shares can be helpful for other parents facing similar struggles and professionals working with youths with similar challenges. However, he’s quick to point out that every child and every family will have different experiences and obstacles. Schwartz doesn’t try to tell parents how to handle their child, but shares what he and his wife faced with Joseph, how it worked out, and the information he gathered along the way. Many of the facts he provides will be familiar for social workers, but the disagreements brewing on some topics may be new. The author reports the path his family chose, leaving the final analysis to the reader, while the debates rage on. Readers may feel conflicted about the paths the Schwartzes took, and they also may be disheartened at some of the (unfortunately all-too-common) obstacles they faced from teachers, administration, and even the professionals consulted for counseling. — Brandi Redding is the assistant editor of Social Work Today.